Industrial deafness is currently the most common ‘occupational disease’, accounting for around 75% of all occupational disease claims. Exposure to excessive noise causes hearing damage. Industrial deafness, also known as Noise Induced Hearing Loss, refers to hearing damage caused by exposure to excessive noise at work. There are a number of reasons why hearing can decline over time, including, amongst others: head injury, a period of illness, and exposure to excessive noise. Sometimes the decline may be idiopathic, which is a doctor’s way of saying they don’t know the reason. The most common cause is ageing, which is known as presbycusis. To identify hearing loss caused by exposure to noise, as opposed to more common explanations, requires expert medical evidence. The medical expert will carefully review the patient’s occupational and medical history and perform a hearing test. Hearing test results are displayed on a type of graph called an audiogram. There are two graphs, one for the results across each ear. In simple terms the audiogram shows the volume at which the patient detects noise across a range of frequencies. The two main factors the medical expert will look for to identify industrial deafness is (1) a history of exposure to excessive noise, and (2) hearing loss consistent with exposure to excessive noise. Industrial deafness has a very distinct pattern of hearing loss which can be clearly seen on the audiogram. Industrial noise typically resonates between the frequencies of 3000 and 6000, as a consequence this is the frequency range typically affected by this type of noise exposure. Unfortunately this is also the frequency band which covers human speech, and explains why industrial deafness is such an isolating condition. 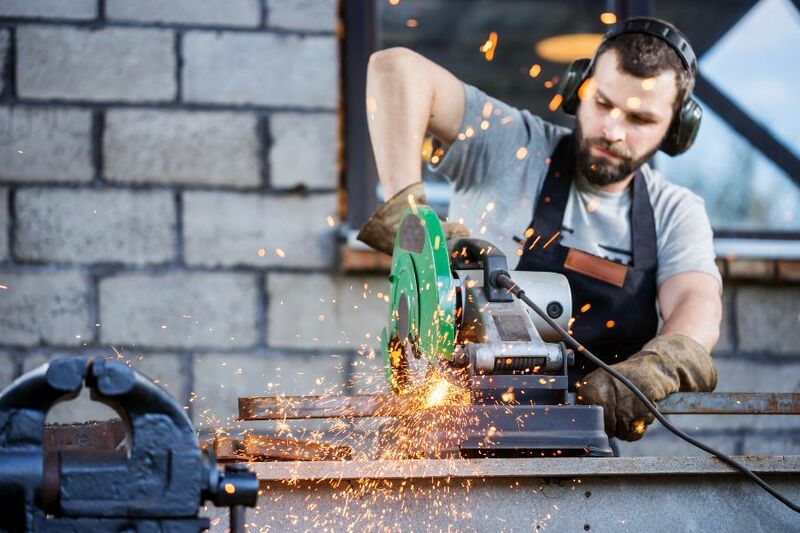 Before a hearing loss can be diagnosed as industrial deafness, there must be evidence of a history of exposure to excessive noise. But what is excessive noise, and how is it calculated? Noise exposure is assessed over the course of an 8 hour working day, regardless of actual hours worked. Onset of damage occurs from an average daily exposure exceeding 80 dB(A), however there is a large variation in susceptibility between individuals. The higher the noise level, the greater the damage. The longer the exposure, the greater the damage. For example, an engineer in a ship’s engine room experiencing an average daily exposure of 103 dB(A), would sustain similar damage in 6 months to a factory worker experiencing an average of 85 dB(A) over 30 years. The accurate measurement and calculation of an employee’s occupational noise exposure therefore requires expert evidence from an acoustic engineer. The expert may base his calculations on noise readings from similar workplaces to undertake calculations or, where possible, may attend at the employee’s place of work to obtain his own readings using a device called a dosimeter. Although all daily exposure above 80dB(A) will contribute to noise-induced hearing disability, it may not be considered as negligent exposure. As there was no generally recognised scientific awareness of the dangers of occupational exposure to noise prior to 1963, any exposure in the preceding years is unlikely to be considered negligent. From 1963 to 1990 employers had a duty under the common law to take reasonable care to avoid exposing employees to foreseeable risks of injury, including exposure to excessive noise. Based on scientific knowledge at that time, only exposure in excess of 90dB(A) was likely to be regarded as negligent. It was only in 1990 that legislation was introduced fixing limits on noise exposure, initially at 85dB(A). The exposure threshold was further reduced in 2006 to 80dB(A). As you will appreciate, claims for industrial hearing loss can be evidentially challenging, scientifically complicated, and require detailed knowledge of how the law, and scientific awareness of the dangers of noise, have changed over the years. Having acted for many men and women with industrial deafness for decades, Allan McDougall Solicitors are established experts in this field. If you would like to have a confidential discussion, please get in touch.